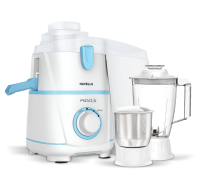 The havells juicer mixer grinder has 500 Watt copper winded motors which lead to longer life of motor & superior performance. It's stainless steel juicer mesh for enhanced life and better juicing efficiency. To Recieve updates and possible rewards for Havells Rigo 3 Jar please sign in. To Recieve updates and possible rewards for Juicer Mixer Grinder (JMG) please sign in.